Added on May 8, 2017 by C. Maoxian. I sent out this short set-up in $LBTYK for April 27 to everyone who signed up for my free Daily Trading Idea ... sign up now if you haven't already done so. Here's the image I sent in the email ... I checked my records and I did short $35.10 at 2017-04-27, 12:09:35 on ISLAND, no doubt by accident after transposing the numbers ... I do this at least ten times a day, make trading mistakes I mean ... confidence-inspiring, I know). So the question is what do you do when it gaps below the target? I'm going to cover half tomorrow morning and trail the stop above today's high of $32.54. I can see this thing going down to $29 or even $26, but I want to take half off the table now. If you have any better ideas, I'm eager to hear them (on Twitter or via email), and I will share them in turn! Initial risk was 44 cents and the target was over $2 away so the risk/reward was 1:5, and if I cover near where it closed it will be closer to 1:10 ... a "ten bagger." Sign up for my Daily Trading Idea today, it's free! UPDATE: @DavidTaggart suggested moving the stop to the high of two days before every time it makes a new low. @Contrahour suggested an Average True Range based stop, which is a little more complicated, so I'll go David's high of two days ago for now. Added on April 21, 2017 by C. Maoxian. Now that I'm in front of the screen full-time once again, I've decided to revive the Daily Trading Idea newsletter. Every night I send out a trade idea for the following weekday. You can sign up by emailing me at maoxian@gmail.com or filling out the contact form. The ideas are always simple and straightforward, taken from the daily chart. I'll keep a spreadsheet in Google Sheets that tracks their progress, which anyone can look at at any time. And I plan to share short videos of any day trades I make in the daily trading ideas. Here's the idea for Monday, April 24, 2017. 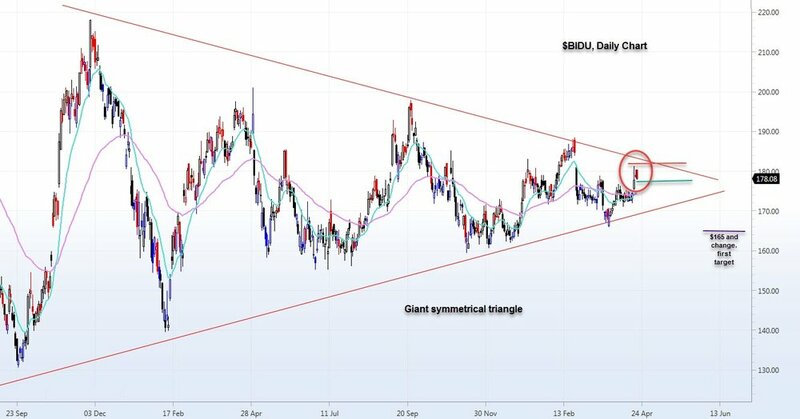 Short $BIDU. The green line marks the entry area, red line marks the protective stop area, and purple line marks the target area. Sign up by email since I won't be posting these to the blog or Twitter ... it will be a strictly "members only" thing ... free for now, of course. Next leg down ... keep an eye on it. Same pattern in VXX, UVXY (2x), TVIX (2x), etc. If the market rallies then gold will fall, so the gold short (and Kinross) makes sense. Other outstanding shorts like GILD, TWTR, etc. will have to be scratched. UPDATE: The Swiss National Bank messed things up ... volatility and gold jump, the broad market drops hard on their move. TWTR and GILD shorts benefit. This stock got hit before Christmas on some news about a deal with Express Scripts ... after going sideways since last August. Recent up move may be a nice spot to put on a short if it breaks below $101.75. Keep an eye on it. Added on January 9, 2015 by C. Maoxian. Want to see KGC fall to $2 ... the chicken entrails are divining it and who wants the yellow metal in a deflationary world? Added on December 26, 2014 by C. Maoxian. Gap's ticker symbol is GPS even though I think GAP is available. Anyway, if it breaks down from the bearish wedge, it could go back to $35. Maybe Yahoo will go back to $45 here ... bit of a countertrend set-up but keep an eye on it. Added on December 20, 2014 by C. Maoxian. Discovery has been weak all year ... it should go back down to 31 and change if you're a believer in chart voodoo ... keep an eye on it. Similar to KEY from the other day ... SCHW needs to give everything up if the charting gods are to be appeased. Alibaba was my long idea from the other day and the worst possible thing happened to it... price drops, picks off everyone down to $101.20 then reverses on a dime and flies closing at $107.50. Not nice. I'm still bullish on it, still see $120s for sure, just realize that you can't trade it like a big dummy. Added on December 4, 2014 by C. Maoxian. Another thing to keep in mind ... now that I've got the swing of the LiveCharts, I'm able to look through things quickly and come up with a daily idea.